The auspicious period of Navaratri and its energies are the most significant this month. We shall have the presence of Devi Adi Shakti on Earth and her energies. It would be a wonderful period for Meditation and spiritual growth. The special energies help us to connect to the loving and nurturing aspects of Devi easily. We can also draw a lot of inner strength and Wisdom from them. Adi Shakti will also carry with her special energies that can help us to heal our inner wounds and outgrow incidents that have hurt us and struggling to overcome. They also help us to clear and transcend various hurdles which we have been struggling with. On the last three days of Navaratri, the Rishis will be anchoring many new energies and also initiate new spiritual projects. The period of Pirtu Paksha also ends which has been amazingly beneficial for those who could make use of the opportunities. With Navarati, we also come to the end of this phase which began with Ashada Masa, during which we had numerous Divine Personalities and special energies on our Earth. During this period of roughly four months, we have received numerous Blessings and help from the Divine. A lot of new energies were anchored in this period and guidance and help was provided to all those who sought. Interestingly, Pralaya intensifies and processes like natural calamities only increased in spite of all the help and Divine intervention. This is occurring because the majority of humanity still doesn’t care. They are “asleep” or unwilling to change. More efforts are required from our end! At the end of the day, it is for us, humanity to awaken and transform. The Divine can only assist from outside. This is also a period where we are clearing our darkness within. Hence all that cannot be directly cleansed, we go through them at an accelerated pace. Many are going through the suppressed aspects, some karmas and runas. The Rishis mention that if at any stage, we find the situation around us very tough or overwhelming, let us hold a lot of dark-Blue Light and keep experiencing it. Then let us send the same Light to the situation which is bothering us. With patience and regular practice of this, we will be able to witness positive results. This is the last day of the fortnight of Pitru Paksha, which is meant for connecting to our ancestors. We can connect to the Pitru Devatas and to our ancestors more easily. The energies of Amavasya will also be present. It would be a mix of various energies on this Amavasya and energetically it will be unclear. Those who are sensitive could experience anxiety or even minor health upsets. At such times, pause and be composed and give yourself a little time. Things will settle down. Slow deep breathing/Pranayama with Light will definitely help. The Rishis will also release various new energies on this day. These energies will be related to the coming period as well as lay foundation of various new projects. They also help to enhance the ability of humanity to absorb the spiritual energies better. An amsha of Goddess Adi Shakti will be present on our Earth during these ten days and it will be a wonderful and highly energetic period. It is a wonderful time for prayers, introspection and Meditation. Through Goddess Adi Shakti, we will also be able to connect to the individual amshas of Devi Mahalakshmi, Durga and Saraswati. We can experience their love and energies and absorb them through Meditation. On all the days, we can make Sankalpas (spiritual resolutions) as well as place our prayers to Devi. Then connect to Her and experience. The blessings work through our hard work and efforts. When we connect to Devi, we will be able to connect to the aspects of Divine Mother, protector and guide. Her energies will also help us further in clearing our inner blocks and fears. She also contains the entire spectrum of Spirituality with Her– powers to higher Spiritual experiences, unconditional love to tough justice and has a perfect balance between all of them. Then offer your respects, gratitude and Love to Goddess Adi Shakti. You can also place your prayers to Her. After this, imagine dark-Bluish-Pink Light coming from Goddess Adi Shakti and allow this to fill you gradually. Allow the Light to fill you from head to toe and as the Meditation progresses imagine yourself to be radiating and shining in this Light. Along with the Light, also consciously keep experiencing the Love of Devi. Repeat the mantra “Om Antarayai, Adi Shaktiyai Namaha” silently. Navaratri also has many important days which symbolises the victory of Light over darkness. Let us connect to these aspects as well. We can pray for blessings and inner strength within so that we can become more peaceful, full of Love and radiate Light. Let the Light win over our inner darkness. We can also pray for humanity and the Earth and wish for Peace and the New Age to manifest sooner. On the day of Vijaya Dasami (19th), we shall have the energies of MahaVishnu as well along with the energies of Devi. 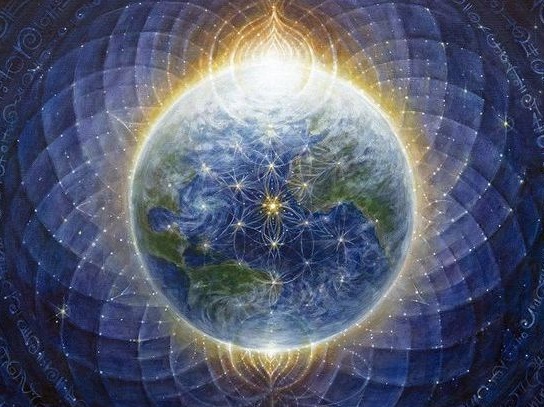 Express your regards and connect to these energies as well. On the Full Moon Day, we always have new energies that strengthen our spiritual pursuits and help in inner cleansing. It is a wonderful day for introspection and Mediation. Connect to the Moon God/Chandra Deva and pray for balance of your material and spiritual aspects of life. His blessing will definitely help the individual and their family’s wellbeing. Imagine light-Violet Light coming from above and allow this Light to fill your entire body gradually. Imagine the Light to fill every cell in the body. Every time I visit your page I get support , help to live in Balance and joy of knowing subtle realities. I sincerely Thank you for great divine work.